We are an accomplished manufacturer, trader and supplier of Earthing Rod. It has high durability and is developed by using high grade metal. exothermic welding is a process that achieves the molecular binding among two or more metallic conductors by a chemical reaction. This molecular binding improves mechanical, electrical and anti-corrosion properties compared with any mechanical connection. 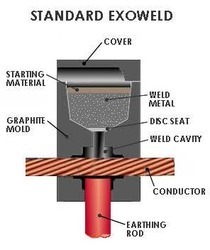 Apliweld® exothermic welding is the best way to make permanent, reliable and high conductivity connections for any installation requiring an earthing system. We are well-renowned as an affluent entity, instrumental in offering an assorted range of Galvanized Earthing Rod which can easily installed in lightning arresters. Offered earthing rod is precisely designed from finest material & modern technology in accordance with the set norms of industry. 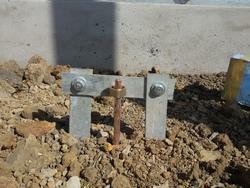 The given earthing rod is available from us on numerous specifications to choose from. Our earthing rod is tested on quality provisions so deliver a defect free range. 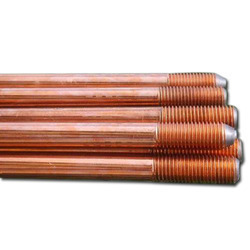 We are recognized as one of the trusted manufacturers and suppliers of a broad range of Copper Bonded Earthing Rods. These rods find their use in varied industries for electrical earthling applications. Under the stern supervision of our diligent experts, offered rods are precisely manufactured in line with the set industry norms using quality approved raw materials. Moreover, our valued clients can avail these Earthing Rods in varied dimensions at reasonable prices. 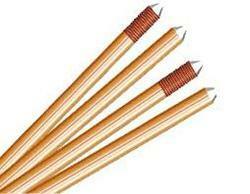 We are involved in offering a qualitative range of Copper Earthing Rod. The offered earthing rod is high on demand for its excellent quality & best finishing. This earthing rod is developed in our advanced manufacturing unit by using high quality material with the aid of cutting-edge technology. In addition, customers can avail this earthing rod from us in various specifications to choose from. We are a remarkable entity, engaged in offering a superior quality assortment of Copper Bonded Earthing Rod. This earthling rod is appreciated in the market due to its performance and longer service life. Our given earthling rod is developed by our experienced professionals in sync with global quality standards using tensile steel core, molecularity bonding pure electrolytic copper. As well, this earthling rod is inspected on well-defined parameters before dispatching at customer’s end. Leveraging on our vast industry experience and knowledge, we have emerged as notable manufacturer, trader and supplier of Brass Earthing Rod that has excellent charge and electric current capacity. Our given earthing rod is developed from the high quality of material & modern techniques as per the defined industry standards. 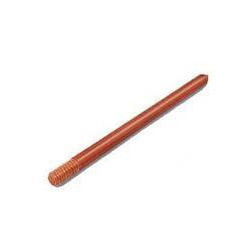 This earthing rod is available on diverse specifications as per the variegated demand of customers. 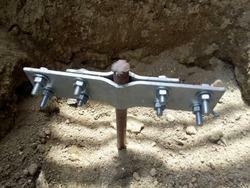 Besides, this earthing rod is tested on several quality parameters in order to ensure its flawlessness. We are recognized as one of the trusted manufacturers and suppliers of a broad range of Copper Bonded Earthing Rod. These rods find their use in varied industries for electrical earthling applications. Under the stern supervision of our diligent experts, offered rods are precisely manufactured in line with the set industry norms using quality approved raw materials. Moreover, our valued clients can avail these Earthing Rods in varied dimensions at reasonable prices. We are recognized as one of the trusted manufacturers and suppliers of a broad range of Earthing Rod. These rods find their use in varied industries for electrical earthling applications. Under the stern supervision of our diligent experts, offered rods are precisely manufactured in line with the set industry norms using quality approved raw materials. Moreover, our valued clients can avail these Earthing Rods in varied dimensions at reasonable prices.